1) 28 May, 2010: The banana crop of 2010 revealed but really about our recommended tasks in the garden this week. 2) 28 May, 2010: The wonderful lemon fragrance of Backhousia citriodora. 3) 28 May, 2010: More about bananas – our Outdoor Classroom on thinning to get better crops. 4) 28 May 2010: The burgundy coloured loropetalums, China Pink in our case, are a splendid additon to our gardens here. 5) 26 May, 2010: The story of Cordyline Red Fountain. As autumn morphs into winter here (to paraphrase our inimitable television weather presenter), we seem to be doing the Squirrel Nutkin impersonation and following a food theme. We aim to be self sufficient in vegetables and most fruit – I say aim, some years we get closer than others. But with only two of us left at home these days, I don’t have to resort to buying much fresh produce at all. 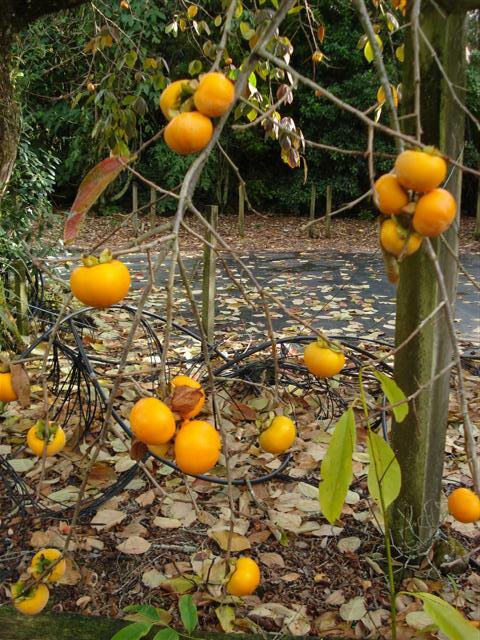 One of the edible crops we grow which we rarely eat ourselves is the highly ornamental persimmon which looks fantastically decorative in the autumn. This is an elderly astringent variety which means one needs to wait until it so ripe it is nearly rotting before it becomes palatable. Even at that stage, I only like the jelly-like segments at the very centre and find the outer flesh rather clarty and sticky. I am sure it would make an excellent gelato, icecream or granita but none of these appeal in the chill of late autumn. It is possible to buy non-astringent fruit and plants which can apparently be eaten crisp, like an apple, but I have yet to bring myself to buy one when we have all these going to waste at home. Except that they are not really going to waste because they bring us a great deal of pleasure over many weeks just adorning the bare branches of the tree. This entry was posted in Tikorangi notes and tagged Abbie Jury, autumn fruits, persimmons, Tikorangi: The Jury garden on 28 May 2010 by Abbie Jury.